HARLEM SHAKE — Six women are competing for a year's supply of hamburgers, $1000 to the charity of their choice and the right to be called Miss Harlem Shake 2015. The contestants include lawyers, web designers, models, dancers, and nutritionists. Some are recent transplants to the neighborhood and others were born and raised in Harlem. And for some this is the first time they have been involved in a pageant. She signed up on a whim while getting something to eat at the Harlem Shake restaurant, which is hosting the pageant, she said. People interested in voting can stop by the store, at 100 W. 124th St., and cast their vote until August. The winner will be crowned Sept. 13. While the contestants would love to get free hamburger for a year, the main prize is a donation to a charity of her choice. While some contestants have participated in bigger pageants, like Miss New York USA, most have not done something like this before. Last week, when the six finalists were chosen from a dozen, pageant hopeful Limore Dooley didn't know what to expect when she walked into the event. "I was surprised, I was completely intimidated when I saw their pictures," Dooley, 35, said. "They all look like models. But I love it. It has such good energy. I got along with the girls as soon as I met them." 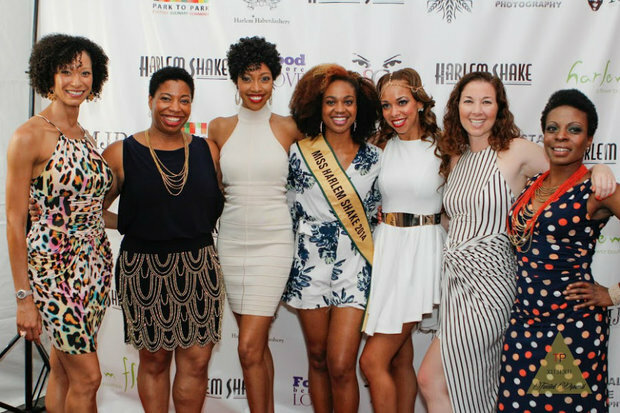 Dooley, a personal trainer and nutritionists, decided to enter the pageants as a way to help Harlem Children's Zone. She has wanted to help the organization since moving to New York six years ago. When she found out the winner gets $1,000 for a charity of her choice, she decided to sign up. "I want to bring health education to Harlem," she said. Bio: Rivera is a production assistant and an aspiring photographer who has taken classes at the International Center of Photography. She enjoys yoga, biking, jogging and fashion. Bio: Mixon is a professional dancer who specialized in ballet, contemporary and jazz and graduated from Juilliard. She has performed for Paramount Pictures, Disney, and the Metropolitan Opera. Her favorite shake is the Salted Caramel Shake. Bio: Gilmore is a Texas-licensed lawyer and graduated from Howard University’s School of Law. Bio: Dooley has been promoting healthy eating through her food blog “Healing the Hangry,” since 2005. She is a personal trainer and a nutritionist who wants to bring health education to Harlem by installing roof-top gardens. Bio: Mobley was born and raised in Harlem. The Miss Harlem Shake Pageant isn’t her first rodeo, she participated in the Miss New York USA Pageant. She also mentors children in her spare time and wants to set an example of how they should put themselves out there and pursue their passion. Bio: Gilbert never thought she would enter a pageant but after friends and family encouraged her to “do something out of the box” she decided to join. She helps build websites as a user experience designer and wants to show people that there are women in color in the tech industry.